For all the claims of government communication being expensive or ineffective compared to the private sector, government has topped the Vision 6 Email Marketing Metrics Report for January - June 2012. Vision 6, an email marketing company based in Queensland, has reported on the email marketing effectiveness of Australian companies and agencies for the last five years. Government has consistently performed well in these reports, well ahead of industries such as IT & Telecommunications, Insurance and Superannuation, Advertising/Media/Entertainment, Retail and Consumer Products, Hospitality and Tourism and other 'traditional' heavy email marketers. 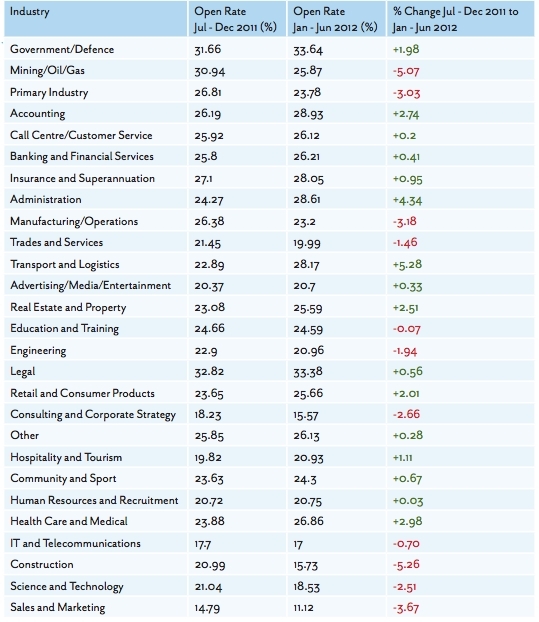 In the January - June 2012 report, Government topped the list of 16 industries both for most email opens (33.64%) and most clickthroughs (8.89%). Looking across all industries, the average bounce rate for emails was around 5.5%. This varied slightly by size of list, the lowest for lists of 10,000 or more email addresses at 5.01% and the highest for lists of 500-9,999 email addresses at 5.81%, with Government averaging 5.38% across the board. The lowest bounce rate was received by the Trade and Services industry at 1.98% and the highest by Science and Technology at 11.67%. All days saw fairly even open and click-through rates, dispelling the myth that people prefer opening emails on Tuesdays, and Thursday appeared to be the most popular day for sending emails, despite being average for open and click throughs. Almost two-thirds of emails (64.65%) that were opened were opened within the first 8 hours (30.2% within one hour and another 34.45% between one and eight hours), four in five within 24 hours and 91.66% within 72 hours (three days) of sending. Vision 6 says that with increasing use of mobile devices the time before emails are opened is falling - so with only about half of Australians using smartphones and 12% of households owning a tablet (compared to 18% in the US according to Pew Internet), there's plenty of scope for email open timeframes to continue to decrease. Mobile has become so important already for consumers that Vision 6 also reported that the iPhone mail application has leapt into third spot (at 16.28%) behind Outlook 2003 (at 17.54%) and Apple Webkit (at 16.53%). In fact mobile accounted for 24.33% of all email opens. To gain more insights on email marketing, and to view all of the reports back to 2006, visit Vision 6 Email Marketing Metrics centre. average for open and click throughs.